We have been collaborating on projects with the Amagasa Lab of Showa Women’s University for three years now. 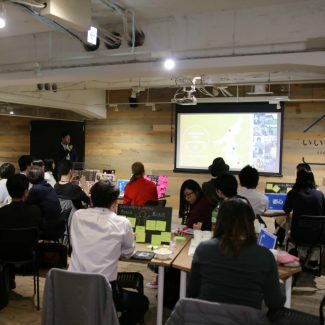 On November 16th the latest presentation and workshop was held at the Ii-office in Ueno. This year we continued working on the theme “Quest for Happiness on Route 17,” digging one step deeper into life on Route 17 through fieldwork observations in varying neighborhoods from downtown Tokyo to Tsubame-Sanjo lively with local manufacturing industries. From the students’ experiences, findings and insights, happiness in the different areas was discussed in the workshop. The guests and students merged in the heated discussion to devise decade-lasting scales to measure the different happiness for each area. With many guests from different fields and walks of life, the students had a load to gain from the feedback they received this year. We send our heartfelt gratitude to the guests who took their time to take part. Another project will be coming up next year, so please keep your eye on us. © 2008-2019 株式会社インフィールドデザイン | infield design inc.